Jump Starts - All American Towing Inc.
Did you know that many newer cars and trucks with a dead battery should never be jump started by connecting it to another vehicle? Vehicles today are designed to be boosted only through the fuse box. When a vehicle receives a large power surge from the alternator of the operable vehicle, it could cause parts of your vehicle electrical system to fail. This may cause damage to your stereo, navigation systems, electronic dashboard or worse, your vehicle’s on board computer. All American Towing always uses professional-grade power packs to deliver a controlled, direct battery-to-battery power boost to give your car a proper jump start to get it up and running. We can even test your battery to determine if you’re safe to travel. Often it may not be only the battery at fault but could also be the alternator or missing belt causing the electrical system not to charge. We can easily evaluate the problem your vehicle is having, night or day, rain or shine. ATTN: We have read that it may be possible to contact a taxi company to give you a jump start for a minimal fee. The problem here is that most taxi drivers are not mechanics and may not be knowledgeable in how to properly jump start your valuable vehicle. We’ve even heard of a company that tried to use a battery, upside down, on top of a customers battery causing a fire (we towed the burned vehicle). Be safe, only hire trained, licensed and insured tow operators to get your vehicle charged. Your vehicle is important so don’t be fooled by ‘shade tree’ mechanics claiming to know how to jump start your vehicle. 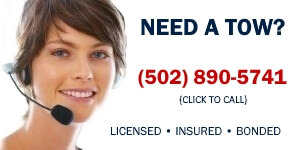 Call our office (502) 890-5741 and we can have an expert roadside assistance operator headed to your direction in minutes.